Halloween isn’t something that I have ever celebrated so this was all totally new to me. This year though we have to decorate as we are to be trick or treated by my eldests pre-school! Now my arts and crafts posting aren’t going to be up to Kids “R” Simple or freebutfun but here we go. My wife started with that indispensable art and craft supply, cardboard egg cartons. 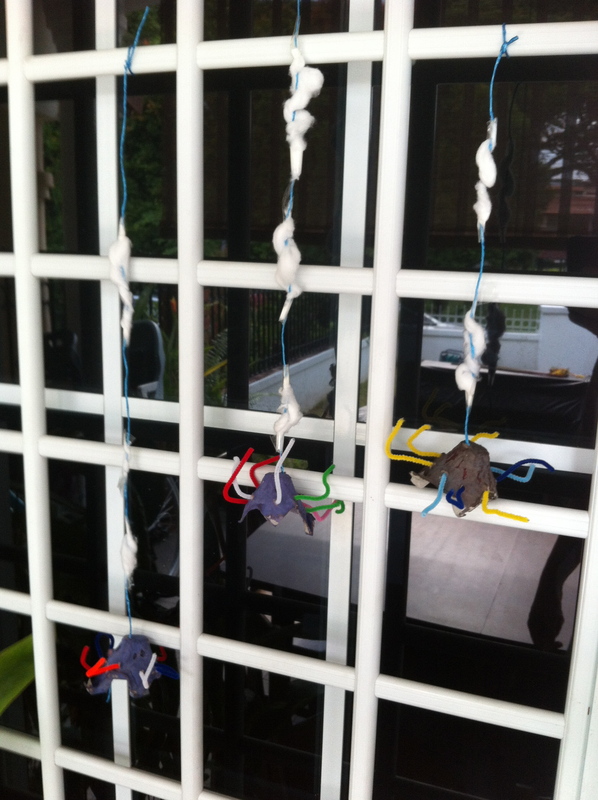 Some black paint and a few pipe cleaners and we have a host of spiders to hang outside. 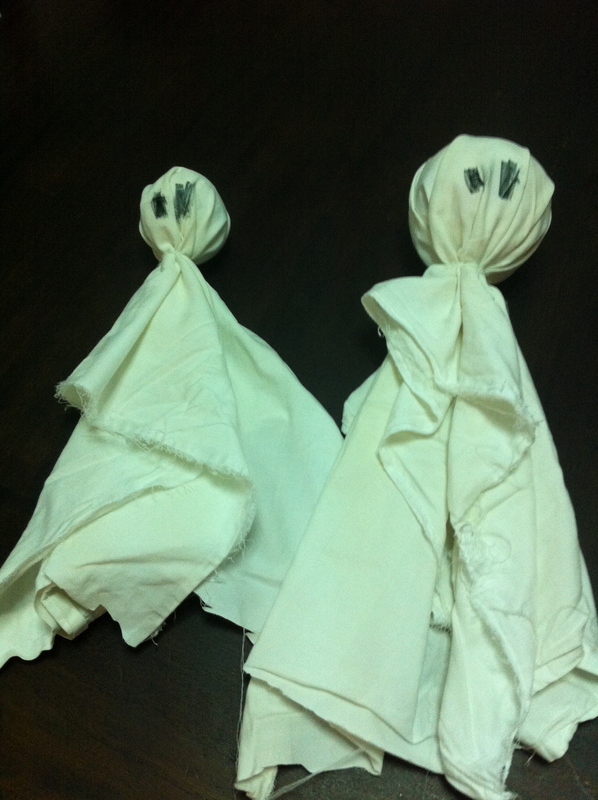 A couple of old pillow cases, some balls and white cotton. 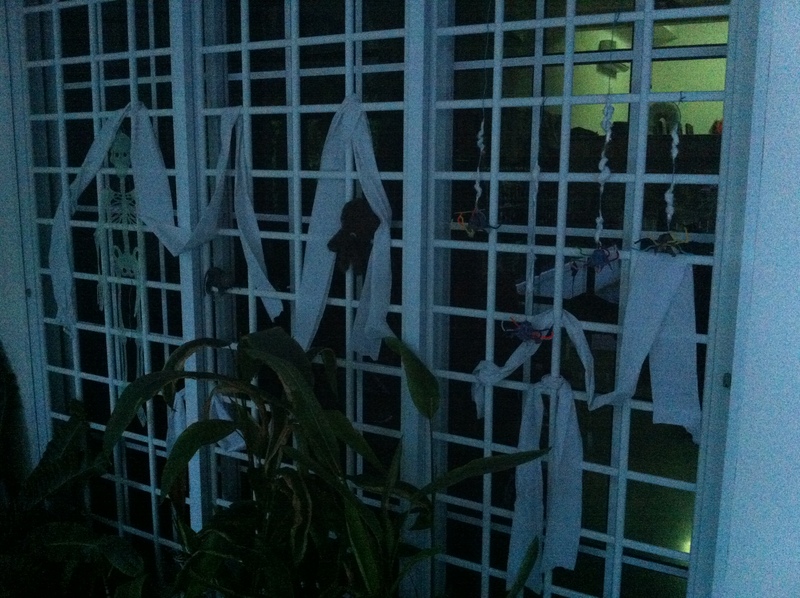 Rip the old pillow cases open, insert ball and tie with white cotton. Hey presto a flock of ghosts to join the spiders. I’m very happy with these as I got to rip the pillowcases apart and so can claim to have made them. Apparently if you haven’t got any spare balls then screwed up paper can work just as well. I thought that was going to be it. Nope, when I got home from work a whole toilet roll had been used to hang over things to make them look more spooky; along with a couple of items from the local supermarket. 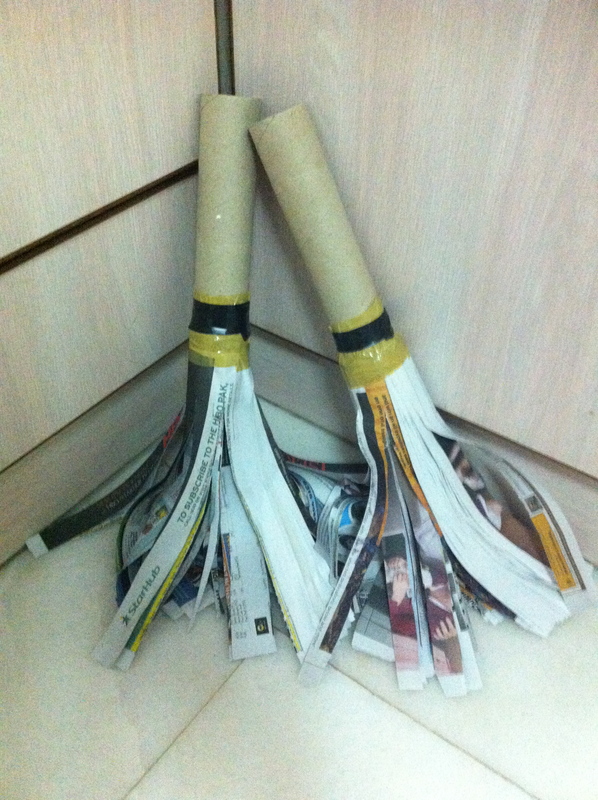 A couple of home made brooms make from kitchen cardboard role inner, masking tape and a newspaper had also materialised today. I think it’s quite obvious how they were made but I do think they are quite ingenious. 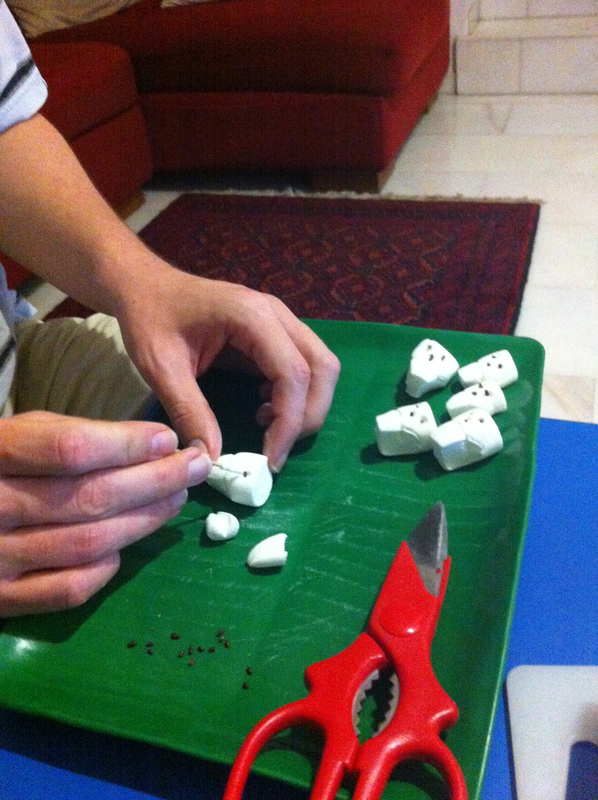 Unfortunately we have not been able to try out our pumpkin carving skills as the pumpkins are too expensive here. Finally some home-made treats, these are Martha Stewart inspired. She put them onto biscuits so cut the marshmallows in half first. But we aren’t doing that and so they don’t get too sticky are keeping them whole. 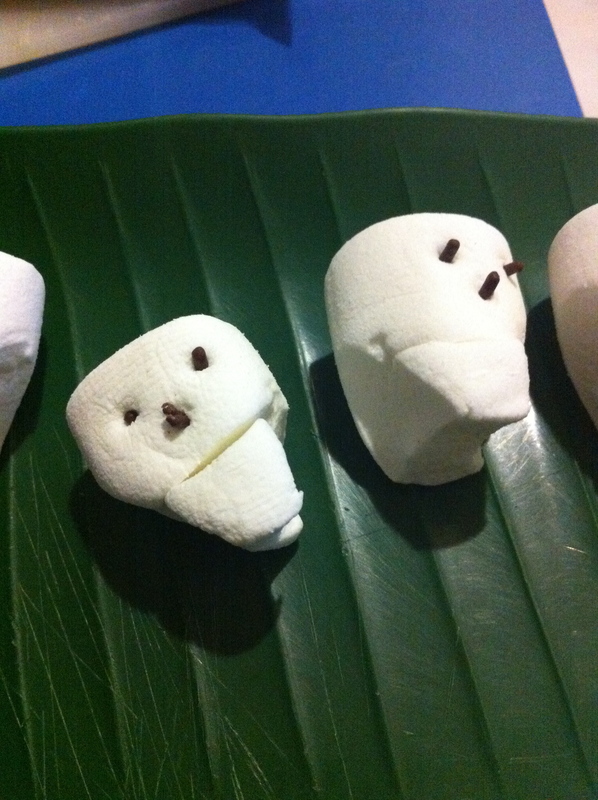 Just cut of 2 slivers to give the skull some shape and then use a cocktail stick to make holes for eyes and nose and stick little bits of chocolate vermicelli in them. Going to be great sending the kids back to school on a sugar rush, not sure we’ll be asked again next year. Genius thinking! Love the ideas. Maybe one year we’ll get around to celebrate Halloween too, will keep these in mind! Love the skulls! Glad you get to send them back to school once they’re sugared up. Nice. Last year we didn’t have any Jack O Lanterns, so I used those Christmas tree lights and I made mini Jack O Lanterns, out of orange cellophane paper and placed them over each alternate light bulb and hung them over the window, the effect was great!